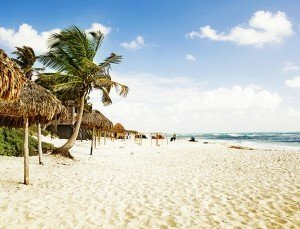 Once a compilation of small fishing villages, Riviera Maya, stretching along the Caribbean coast of Mexico’s Yucatán Peninsula, has since been developed into a modern tourist corridor. White, seashell-less sand connects resort after resort—and is just as beautiful as the pictures you see while surfing the Internet. The beaches are pristine—the water, turquoise. 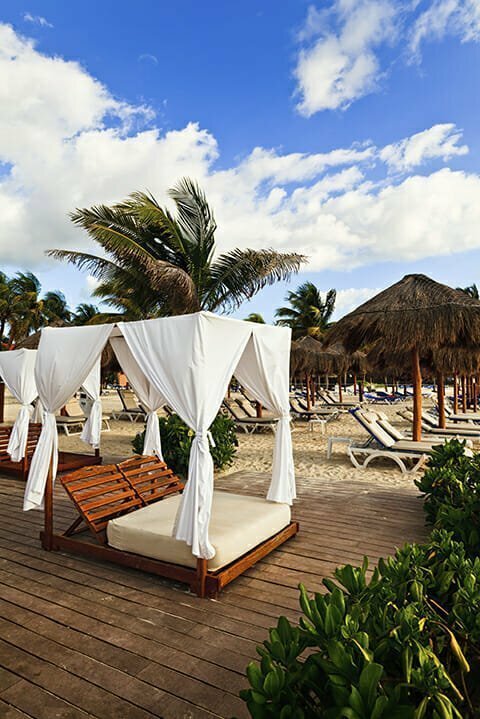 And with just those natural features, it’s no wonder Riviera Maya is known to be the home of some of Mexico’s most stunning beaches. People flock here year after year to indulge in the warm temperatures, beautiful beaches and to take on various adventures like snorkeling, swimming in cenotes and visiting Mayan ruins. My husband and I recently ventured to the Riviera Maya. We checked into our room with an incredible view of swaying palm trees, (one of) the immaculately kept swimming pools and the shimmering ocean. We had only just arrived, and I was already impressed with the beauty of the area—and this was just the resort. Of course the first thing we did was head to the beach so we could stick our toes in the powdery white sand (which was also incredibly soft). Step one of the trip complete. And we still had five more glorious days to relax and enjoy the 75-degree, sunny weather. Thursday was our day of adventure. We woke up at 5:30 a.m. (the only day we had to set an alarm), and were picked up from the resort around 7 a.m. Shortly after, we boarded a tour bus and our journey to Chichen Itza, the most important capital city of the Maya area and one of the new Seven Wonders of the World, began. We traveled two-and-a-half hours inland to reach the city, catching glimpses of small towns and neighborhoods along the way. We learned that the name “Cancún” means “snake nest” (such a scary name for a place we picture to be so beautiful). We learned that Mayan people never actually disappeared—there are seven million living just in the Yucatán—and what their defining physical features are. We learned that the Maya invented the number zero, which enabled them to count into the millions. And when we finally arrived at the site of the ruins, we learned that the Maya were so advanced with astronomy and acoustics that they built their whole city around that knowledge. 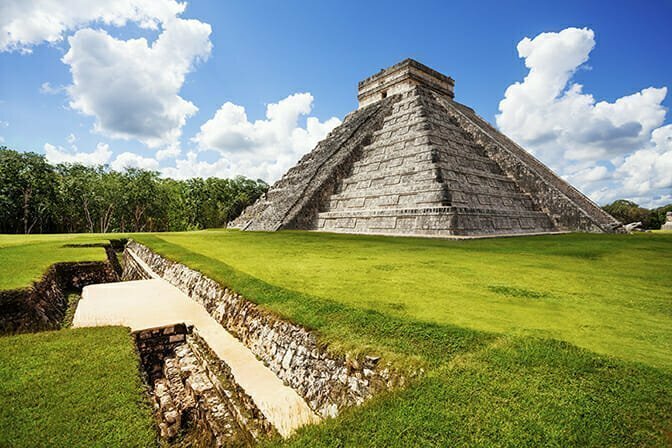 With a single clap from the bottom of the stairs to the temple, directly in front of the opening at the top, they could hear the call of their god, Kukulkan. And at a certain time, the sun created a shadow on the steps of the temple, making it seem like the god was returning to them. Chichen Itza and the Cenote of Sacrifices were, and still continue to be, sacred places for the Maya. Seven years ago they stopped letting people walk to the top of the temple, but that doesn’t erase the feeling of awe when you see the building in person, and the rest of the grounds that are currently open to the public. Maya holds the secrets of the Mayan world, and with the ability to step foot onto something so ancient, it makes this a destination worth visiting, perhaps more than once. Tulum, Coba and El Rey are also highly visited sites of the Mayan ruins, and are equally as beautiful. s appealing for two reasons: it was underground and full of crisp water. Throughout this part of Mexico there is a subterranean world of turquoise pools with mineral-rich waters that are so clear that you can see straight down. These natural swimming holes are the outcome of the collapse of the porous limestone bedrock, creating the beautiful water-filled caves or hidden pools framed by the jungle. The name “cenote” means “sacred well” and they were revered by the Maya because they provided water in times of drought. The one we stopped at and swam in was at a crisp temperature of about 72 degrees, and home to many little catfish. It was also on private property. In Mexico, if you discover a cenote on your land, you get to keep it. It’s yours! A natural swimming hole of fresh water, filtered by the earth. It’s a refreshing experience definitely worth trying if the opportunity presents itself. ance to see tropical fish, turtles, manta rays, dolphins, tiger sharks and whale sharks. 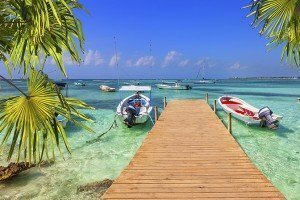 Places like Akumal and Puerto Morelos are great snorkeling destinations. 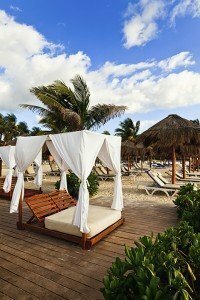 If you enjoy visiting, you might want to explore a permanent vacation in the Riviera Maya. Many planned communities offer the resort life as a primary or vacation residence, including the Bahia Principe Hotel & Residences. 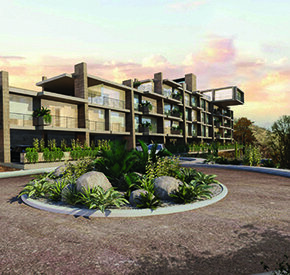 They offer homesites, condos and residences surrounded by two golf courses designed by Robert Trent Jones and four 5-star hotels from the Grand Bahia Principe Riviera Maya Resort, which offers unbeatable services to the residents of Bahia Principe Riviera Maya Residences & Golf Resort. 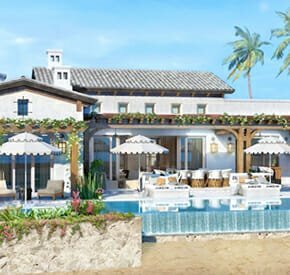 You might want to also check out The Fives Hotel & Private Residences located directly on the beach, surrounded by a fascinating ecological park with more than seven acres of natural beauty. By Jamie Penn. Previously published in the 2015 Spring Issue. Cottage Living – Cozy up on the Coast. 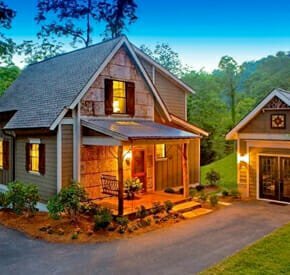 A less-is-more, downsizing trend among homebuyers has sent developers, builders, and architects to the cottage-style drawing board. 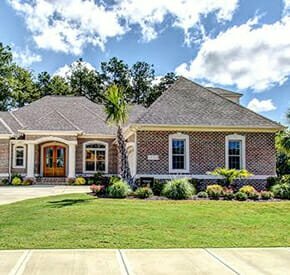 On the East Coast, where million dollar beach houses and inland estate homes in high-end, South Carolina gated communities are rampant, coastal cottages are slowly beginning to pop up around them, often just yards away from the more grandiose homes in upper-end neighborhoods. Request more information from Bay Creek. 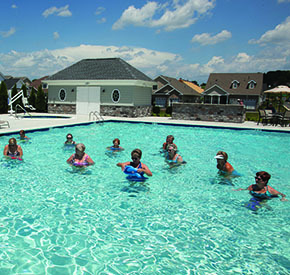 While a few full-timers will soon filter into the Cassatt neighborhood, current homeowners are using their cottages as interim getaways between now and retirement. 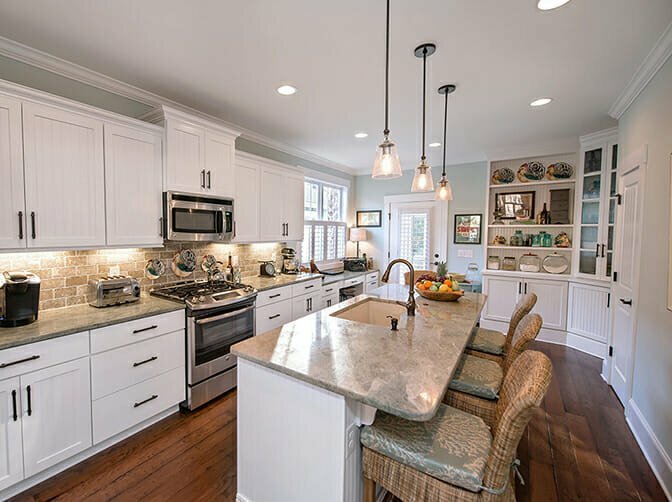 They’ve worked with Harris and Mary-Dolph Simpson, of Simpson Builders Inc., meticulously scouring catalogues, stores, and websites painstakingly searching for the perfect treatments, countertops, cabinetry, siding and ceiling style, all to create the home that they’ll eventually never want to leave. 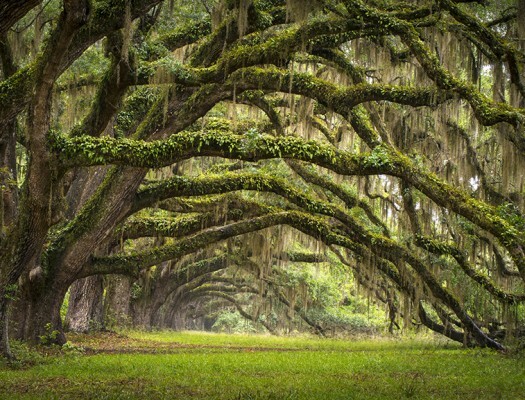 “The nexus of all of it,” said Harris, “is to create place. It’s often the thing left out of developments.” The Cassatt development surrounds a common area coined the Cassatt Green. “It’s what folks are looking for today. 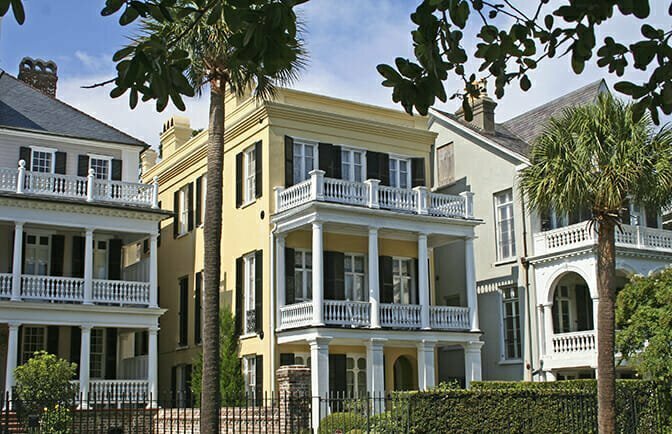 The interior can be very private, as are the backyards and screened in porches, but the front porch and the Green are like a public extension of the home,” said Harris. Mary-Dolph Simpson, born and raised in Norfolk, says building here on the Eastern Shore was a bit of a dream of hers. 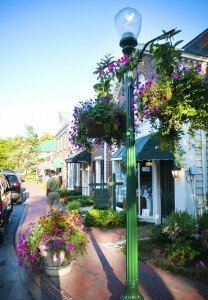 Cape Charles was founded in 1886 and has retained much of its Victorian architecture and colonial heritage. 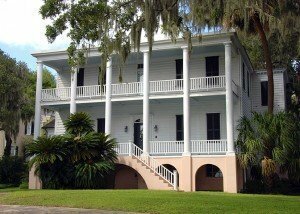 The Cassatt cottages were designed to reflect this sense of tradition and preservation. 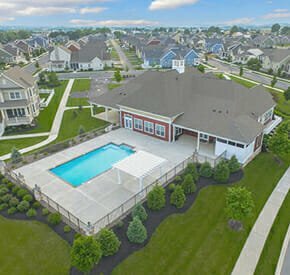 The layout of the Cassatt neighborhood completes an echoing of the small town community feel that attracts so many to the area. 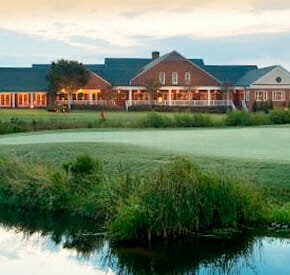 Bay Creek Resort and Club is situated on the Chesapeake Bay at the southern tip of Virginia’s Eastern Shore, just south of Cape Charles, the largest town in Northampton County, with a population of around 1,000. 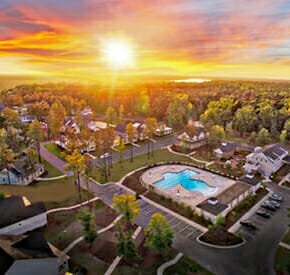 Although Bay Creek is planted in the middle of this timeless gem of an area, it’s a modern resort in the fullest sense of the word. 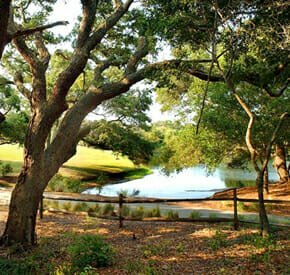 It’s infused with every amenity retirees and families could want, including nature paths that wrap through the flora and seaside landscapes that span generations and beckon vacationers and part-timers to Bay Creek. “People are focusing on what they really need versus what they want. 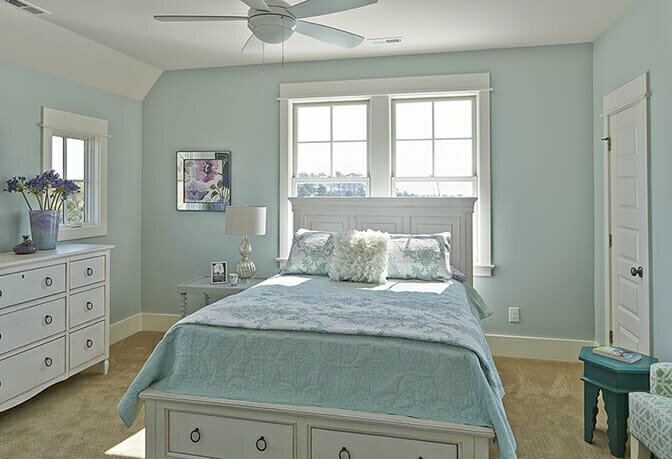 They’re less concerned about showing people what they have, and more concerned about having a well-detailed home that’s comfortable, with sufficient space and just enough flourish.” — Bill Harris of Allison Ramsey Architects, Inc. 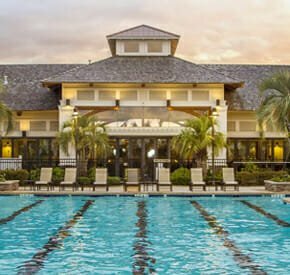 The Beach Club and Fitness Center offers a 2,800-sq-ft members lounge, a 5,000-sq.-ft. fitness center, complete with cardio-theatre, certified trainers, and golf training clubs. There are two outdoor pools, one with a splash zone and a giant slide for little ones. 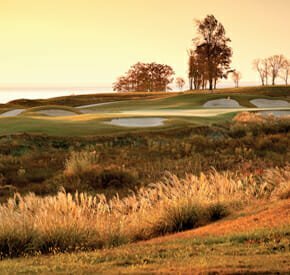 The big draw for many retirees or soon-to-be retirees, like Harris, are the two signature golf courses designed by Arnold Palmer and Jack Nicklaus, that wind through the 10 Bay Creek villages and along the expansive bay. “We’ve been official owners for about 16 months, and we’ve spent a total 40 nights, so we obviously haven’t missed many weekends. The two golf courses are a big draw. But, it’s everything – the beach for the grandkids, the fantastic restaurants, the staff, and the homeowners we’ve met. It’s just everything we want. When I get over that bridge, I feel like my blood pressure must drop ten points,” Riddle said with a laugh. Riddle and his wife, Rosemary, have been long time Eastern seaboard explorers. While passing through the East Bay area, they literally happened upon the Cassatt model while wandering around the Bay Creek Resort. Simpson is well-seasoned in the art of selection. 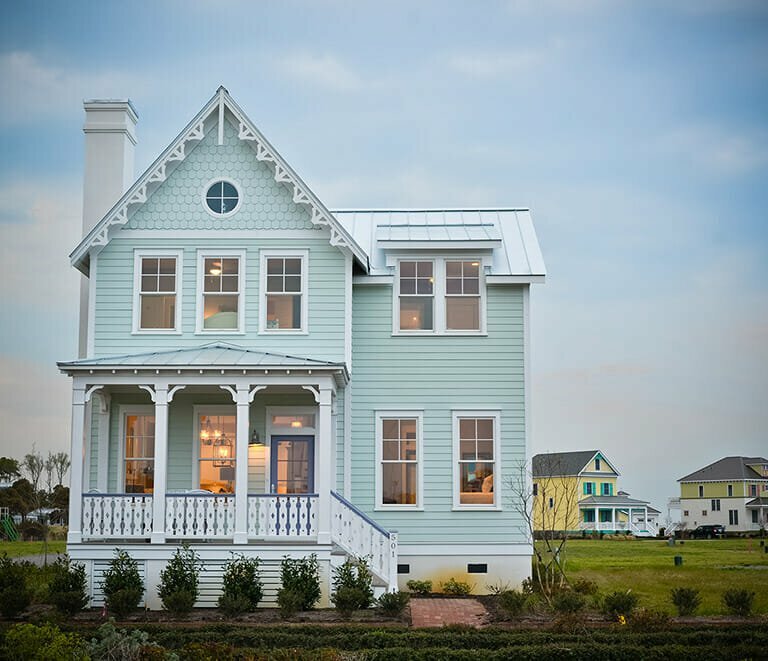 Simpson Builders was responsible for the 2011 Coastal Living Ultimate Beach House in East Beach, Norfolk, and has built many homes in East Beach and in and around Norfolk. “We want to give folks the ability to get what they didn’t think they could afford. You can get so much more by thinking through it,” Simpson said. 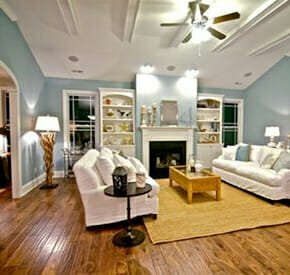 By finding inventive and subtle ways to add definition to rooms – through furniture arrangement, door height, bar space, etc. – Harris and Simpson managed to preserve the close, comfortable feel that cottage-style homes are intended to generate. 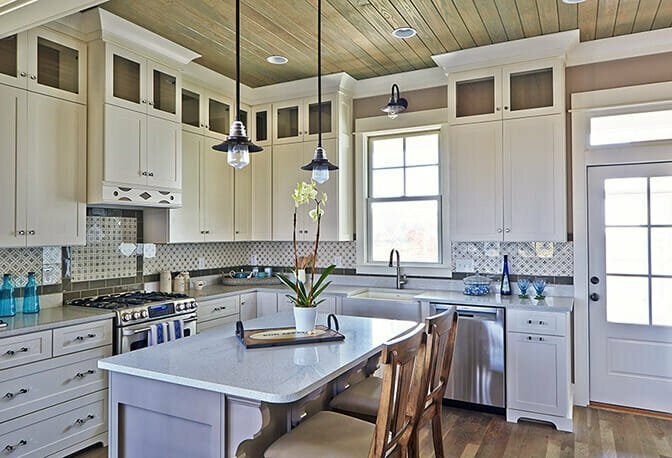 Glass transoms above doors, shiplap ceilings, frame heights, window sizes and ornamental trim are some of many features that synergistically deliver a distinctive cottage feel. Mark Ballard and Tom Finney are in heaven. Decidedly. They both say they got exactly what they asked for when they landed at The Cottages in Ocean Isle, NC about an hour from Wilmington, NC and Myrtle Beach, SC. 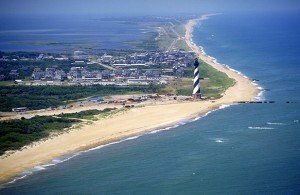 Ballard and Finney relocated to Ocean Isle from Columbus, OH last summer to pseudo-retire. They sold their business, and made a beeline for the south, planning to continue their work in consulting and enjoy life as much as possible. They were attracted for obvious reasons. 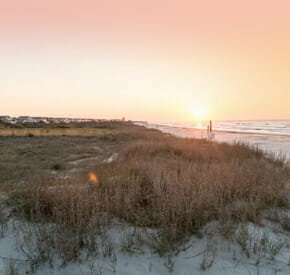 Ocean Isle is a town of around 600 year-round residents, but in the summer it’s a bustling paradise for vacationers. And, it’s somewhere in the middle of several little coastal towns from Wilmington down to Myrtle Beach. When they found the cottages, Ballard and Finney knew they’d found the site for their soon-to-be home. 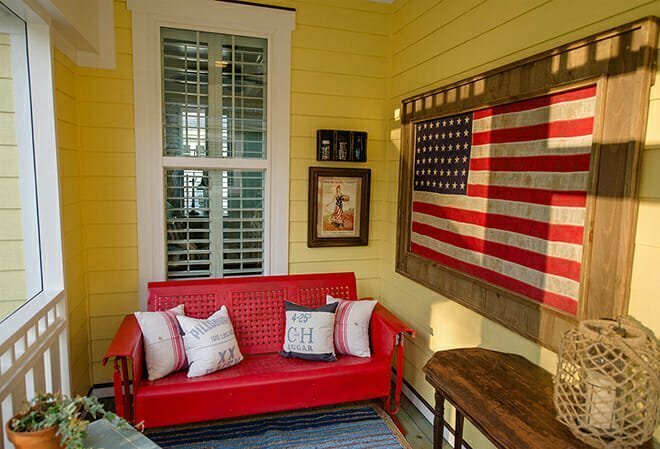 And when they met designer and developer Michelle Cook of The Cottage Building Company in Leland, NC, they were even more devoted. 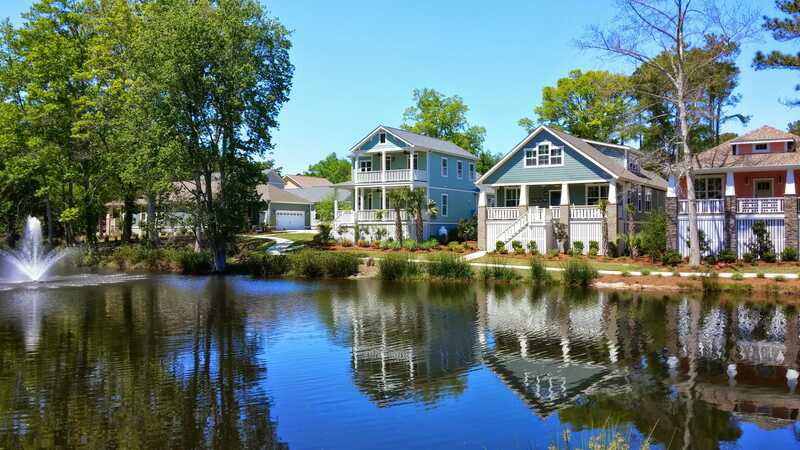 Request more information from The Cottages at Ocean Isle Beach. 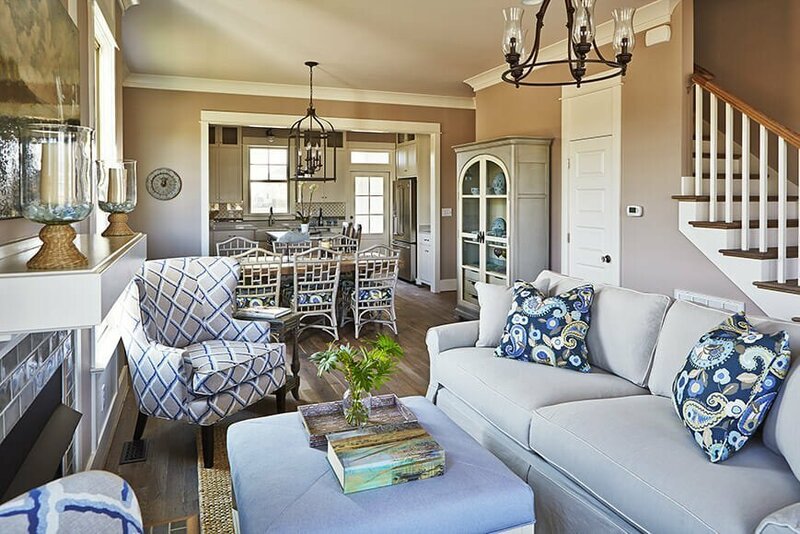 “We were looking for more than a home, we wanted the lifestyle that comes with a cottage community, and we wanted the freedom to customize, I mean really customize. We had been searching for that intensively. When we met Michelle and saw The Cottages, we knew we’d found it,” said Ballard. 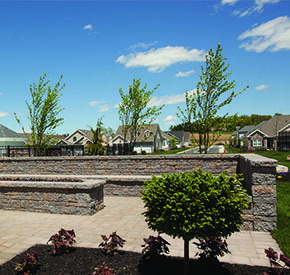 Park-side will also be the perfect scenario for entertaining their three-year-old granddaughter when their daughter and her husband make the trek from Columbus in a few months. It’s also conducive to the social lifestyle both Finney and Ballard desire. The next step – making the thousands of decisions that go into building a home – should have been the hardest, but Ballard and Finney say that it was quite the opposite. The kitchen was also pretty important to Finney. While the term “cottage” has stretched as much over the years as the culture surrounding it, Ballard loves the features that blend historical nuances into their otherwise contemporary cottage home. 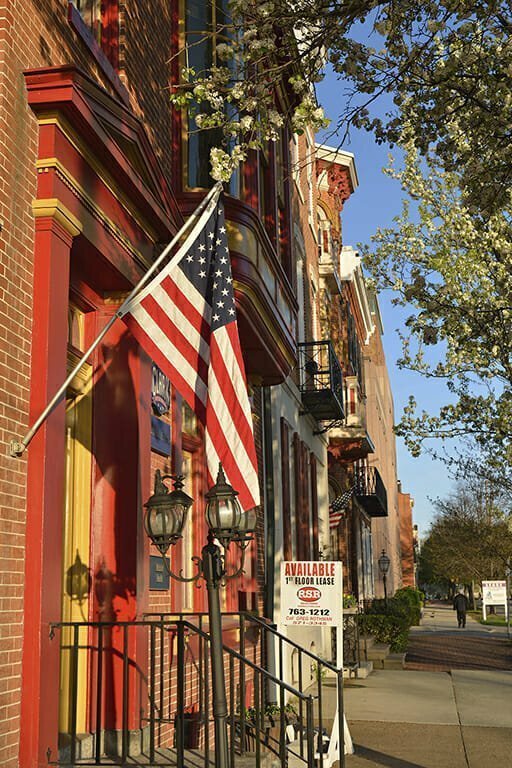 Traditions of America gives retirees set on the Northeast even more reason to escape to the Keystone State. 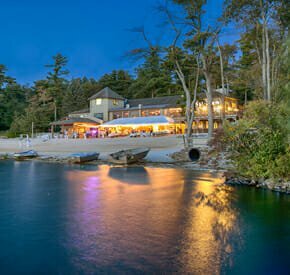 is best known for some of the most bustling cities in the country, much of it is fairly rural, spotted with quaint small towns nestled between mountain ranges, surrounded by high rolling hills and a short drive to the coast. 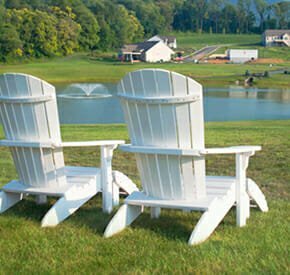 Long-time residents turned retirees are finding respite in just such places not too far from the hustle-and-bustle cities of Pittsburgh, Harrisburg, Philadelphia and NYC, in the Keystone State. 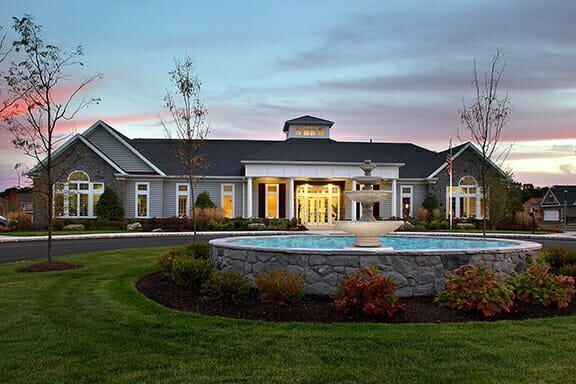 Pennsylvania is moving up on the list of places to retire in the Northeast, but it’s not always for the reasons one might think. While superb geriatric medical care in Pittsburgh and state retiree tax breaks are a huge plus and a definite draw, the folks we found are interested in the lifestyle. They’re avid sports fans, history buffs and life-time learners, volunteers looking to use this stage in their life to give back, social butterflies and urban aficionados ready to re-energize and lovers of the outdoors who want it all at their fingertips. And they’ve all found what they’re looking for in the same place, just in different cities. 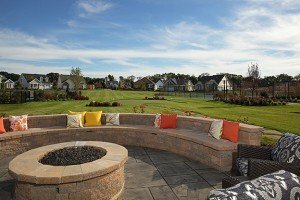 Each couple we interviewed has settled into a Traditions of America community, 55 and up neighborhoods located on the outskirts of Pennsylvania’s most popular cities. Here are their stories. the reasons to retire in Pittsburgh are endless. They left the Pittsburgh area nearly 25 years ago to raise their family in Cincinnati. 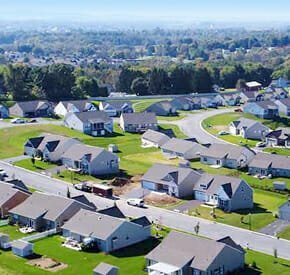 When they found themselves on the cusp of retirement with both of their children off on their own, they decided to return to the “Steel City.” They found an area that they felt was intended for them and just recently settled into their new Traditions home a few months ago. Laurie says she feels like she’s in a city she barely recognizes. “Pittsburgh has been completely transformed,” she says. Once upon a time, Pittsburgh struggled to keep young people from leaving. Now, it attracts young professionals and families from across the country. The old steel mills that gave Pittsburgh its nickname were converted in recent years into shopping centers, museums and public spaces. The arts are thriving, and cultural and outdoor activities abound. There’s the symphony, the zoo, the ballet, museums and Laurie’s personal favorite, the “new” North Side. Bike paths and walking trails wind through and around the city connecting numerous green spaces and parks. “And, the people we’ve met here have just really been great,” Laurie says. ll league and Pine Valley Camp, which is just 20 minutes away in Ellwood City. Laurie says she looks forward to traversing the state. 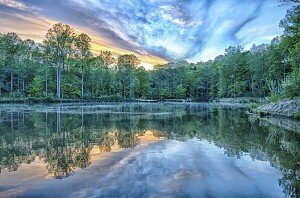 She rattles off a few Pennsylvania destinations from her list, “…the vineyards up 79 toward New York; hiking in the Poconos; Presque Isle State Park; Allegheny National Park. Next month, we’re taking our first official trip to Bedford Springs. in Boalsburg. “We came here largely because of the university. Everything we love to do is here – athletics, art events, theatre and recitals. We can take classes, and there’s a sporting event almost every night of the week,” Jan says. The Deveneys have a daughter who’s currently in graduate school at Penn State and a son living near Harrisburg, PA, both of whom were always into sports. The Deveneys aren’t your average sports enthusiasts, though. They’re into all of it. They typically catch four to five events each week, from football, men’s and women’s basketball and ice hockey to men’s and women’s lacrosse, gymnastics and men’s and women’s wrestling. When they’re not at a game, they’re in the community center with other Liberty Hill residents engaging in their own activities. “We use the clubhouse every single day,” Jan says. They’ve joined a walking group, an aerobics group, a knitting group, a ping pong group and multiple card groups. Oh, and they play golf and go to the gym daily. It’s safe to say that the Deveneys aren’t lacking in energy. Having been born and raised in Pennsylvania, neither can imagine being anywhere else. “We always knew we’d stay. We know Pennsylvania, and we love it,” Jan says. Irene and Allen Leslie raised their family in New York City. Allen was an economist on Wall Street most of his career, and Irene worked raising their four sons who are now starting families of their own. Now that they’re in Bethlehem, they’re about an hour and a half from two of their sons and their two grandchildren. Bethlehem is part of the bustling Lehigh Valley, nestled between Blue Mountain and South Mountain and with Lehigh River running through it. 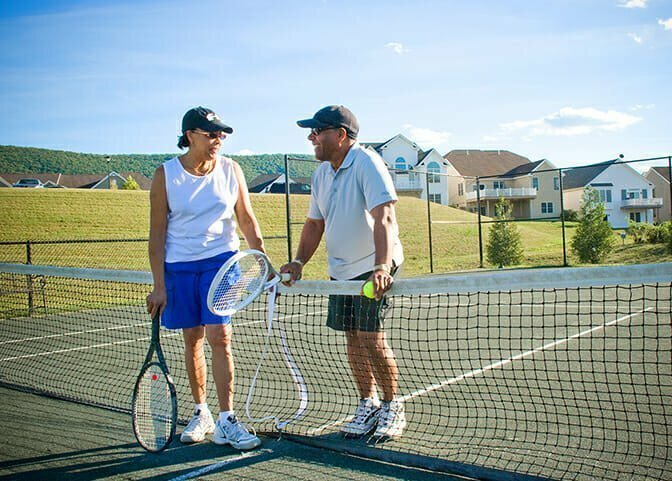 Irene and Allen arrived at Bridle Path less than two months ago, and they’re already a part of the community. They weren’t shy about getting involved. The couple joined a book club and a Friday happy hour club, and they even started a wine club and an all-men’s club, formed by Allen, called the ROMEOs—Retired Old Men Eating Out. Leslie says that they’ve found their home in Pennsylvania, and she can’t wait to explore it. By Jamie Penn Previously published in the 2015 Spring Issue. 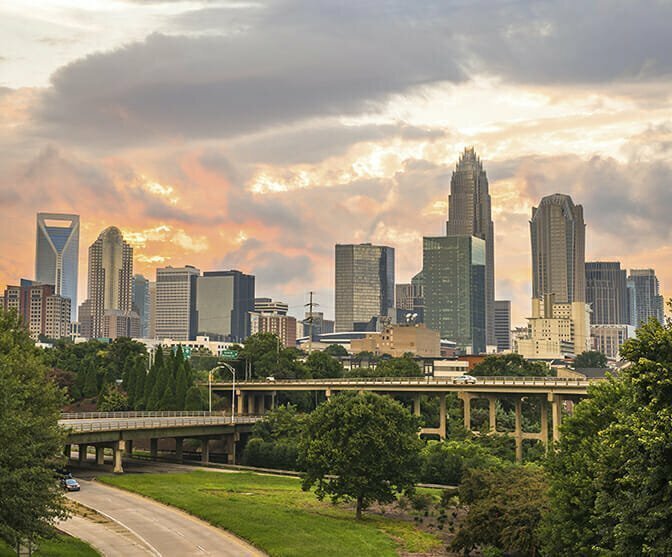 The Carolinas (both North and South) are welcoming an influx of new residents these days and who are discovering a way of life that’s about more than just warmer weather. 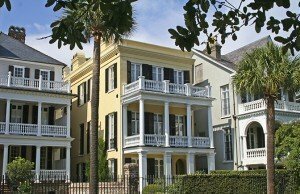 But there’s not a single “Carolina lifestyle,” because each of the states’ distinctive regions have something special to offer. 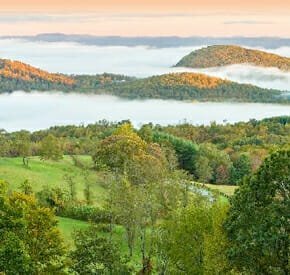 The Upstate region of South Carolina (also known as the “Upcountry”) derives its name from the higher elevations in the foothills of the Appalachian Mountains. 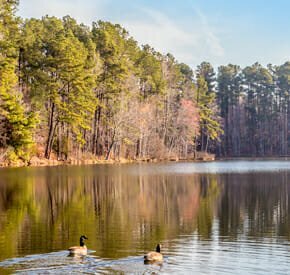 Home to the cities of Greenville, Spartanburg and Anderson, the Upstate lifestyle is as much a product of its history as its topography. While all Carolinians love their music, the strong Scots-Irish heritage in the Upstate seems to have produced a toe-tapping background melody everywhere you go. And not just the traditional bluegrass music so often heard in the states of greater Appalachia, though there’s plenty of that. The Upstate musical lifestyle also includes everything from the annual Blue Ridge Fest in Pickens, featuring golden-oldie performers, to the country-rock sounds of Spartanburg’s own Marshall Tucker Band to Broadway musicals and symphony orchestra performances at The Peace Center in Greenville. In fact, a revitalized downtown Greenville has become a key component of the region’s lifestyle, with riverside nature trails, unique shops, restaurants, art museums and special attractions like “Shakespeare in the Park” performances. Open-air trolleys make it easy to get around, or the area can be explored on two wheels, as both Greenville and Spartanburg have been recognized as Bike-Friendly Cities by the League of American Bicyclists. The Upstate is also home to the USA Cycling Pro Championships. 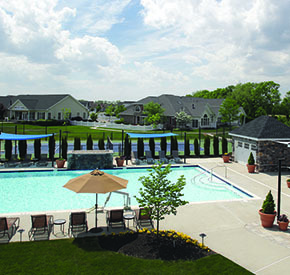 But urban amenities are just a part of the Upstate lifestyle for folks who enjoy the great outdoors. 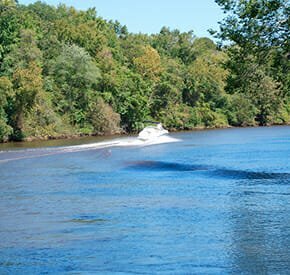 There are more than 80 golf courses in the region, plus numerous highland streams for kayak/canoe trips and whitewater rafting on the Chattooga River. The fishing is also excellent in the crystal-clear mountain lakes. Hundreds of miles of hiking trails criss-cross the region, from leisurely state-park circuits to difficult climbs up steep slopes, some leading to one of more than 35 waterfalls in the area. 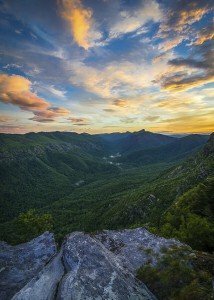 While the South Carolina Upstate is a “foothills region,” the real mountains are found across the border in North Carolina. A significant stretch of the Appalachian Trail runs through the North Carolina mountains, along with hundreds of other highland trails, so hiking and camping are an important part of the region’s lifestyle. Mountain biking and horseback riding are also popular activities, as well as canoeing, kayaking and whitewater rafting. For residents who enjoy less strenuous pursuits, the local hillsides and valleys are home to numerous—and often spectacular—golf courses. The region’s higher altitudes also make the North Carolina mountains perfect for those who love the winter-sports lifestyle. Snow skiing, snowboarding and ice skating are just a few of the cold-weather recreations that are available at a dozen destination resorts in the region. 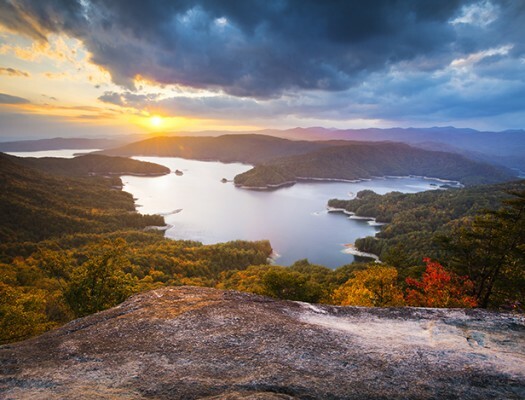 However, the North Carolina mountain lifestyle is about much more than outdoor recreation. This is a region rich in culture and creativity, displayed at venues like The Turchin Center for the Visual Arts in Boone and the Blowing Rock Art and History Museum. Highlighting the region’s summer events calendar are the Grandfather Mountain Scottish Highland Games and Folkmoot USA, an international celebration of music and dance. The North Carolina Apple Festival in Hendersonville has been a fall tradition for more than 60 years, perhaps second only in popularity to the extraordinary autumn colors that are the signature image of the North Carolina mountain lifestyle. The thriving city of Asheville offers residents a variety of urban lifestyle options, from the lively downtown area with its concert halls, art galleries and award-winning restaurants to the exquisite Biltmore Estate located just outside of town. 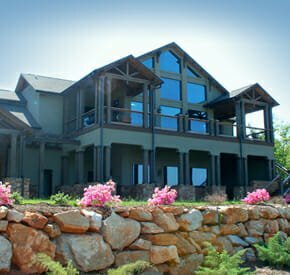 And the mountain lifestyle can include visits to a one-of-a-kind Carolina destination at Harrah’s Cherokee Casino Resort. North Carolina’s central region is The Piedmont, and sports of all kinds are a big part of the local lifestyle. The National Hockey League’s Carolina Hurricanes are based in the state’s capital city of Raleigh. Charlotte, the largest city in the Carolinas, is home to the National Football League’s Carolina Panthers and the National Basketball Association’s Charlotte Bobcats, plus the Charlotte Motor Speedway and the NASCAR Hall of Fame. Collegiate sports in the Piedmont, however, seem to be closest to the heart of the region’s lifestyle. Duke University, North Carolina State University, UNC-Chapel Hill and Wake Forest University are probably the best-known of the Piedmont’s universities when it comes to passionate in-state rivalries in football, baseball and basketball. 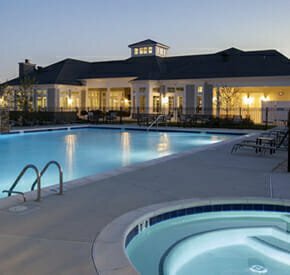 But it’s about more than just sports because the region’s dozens of major universities and liberal-arts colleges add an air of sophistication to the Piedmont lifestyle. In addition to the area’s many historical museums and art galleries, international artists appear regularly at Chapel Hill’s Carolina Performing Arts at Memorial Hall and The Durham Performing Arts Center, the largest facility of its kind in the Carolinas. Nor is the Piedmont lifestyle exclusively a black-tie affair: film festivals and farmer’s markets are weekly events in the Piedmont, a region that has also gained notoriety for its plethora of micro-breweries and brewpubs. 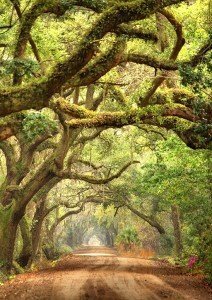 And Piedmont residents like to get their hands dirty, too: a drive through just about any local neighborhood on a spring or summer day reveals well-tended azalea bushes and flowering dogwood trees around private homes in an area of renowned botanical gardens and florid public parks. 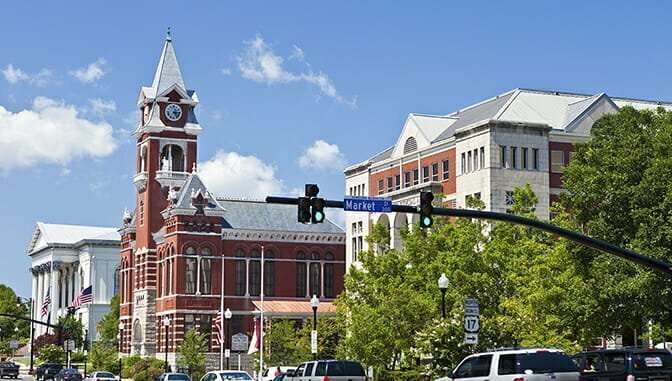 The Piedmont lifestyle is also filled with annual events, from the Mayberry Farm Fest and Tractor Parade in Mount Airy and the National Folk Festival in Greensboro to the Renaissance Fair in Fayetteville and the Annual Barbecue Festival in Lexington. 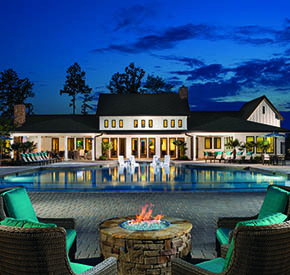 The southern Piedmont includes the Sandhills region and the Pinehurst, Southern Pines and Aberdeen area, with its world-class golf resorts and country-club residential communities. 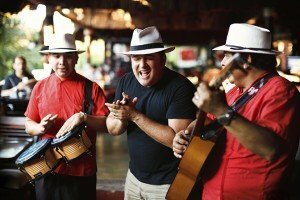 The area also hosts a year-round calendar of cultural activities and family-friendly events. 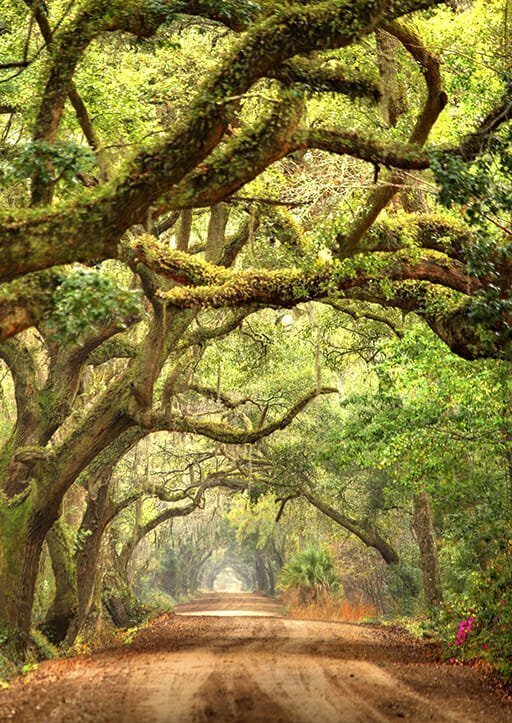 Between the coast and the foothills lies the Midlands region of South Carolina. 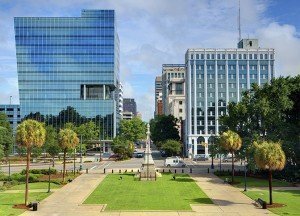 The area’s hub is Columbia, the state’s capital city and home of the main campus of the University of South Carolina, as well as a number of smaller colleges. And because South Carolina provides a tuition exemption for residents 60 years of age and older to attend classes at any state college or university, continuing education is a noteworthy component of the Midlands lifestyle. Cultural activities and events are also significant in the Midlands lifestyle, from musical concerts and shows at the Koger Center and exhibitions at the Columbia Museum of Art, to a lively variety of annual celebrations like the Okra Strut in Irmo and the Peach Festival in Gilbert. Local events also include a number of military-themed tributes because the Midlands area is home to Fort Jackson, the U.S. Army’s largest training post, and Shaw Air Force Base in Sumter. 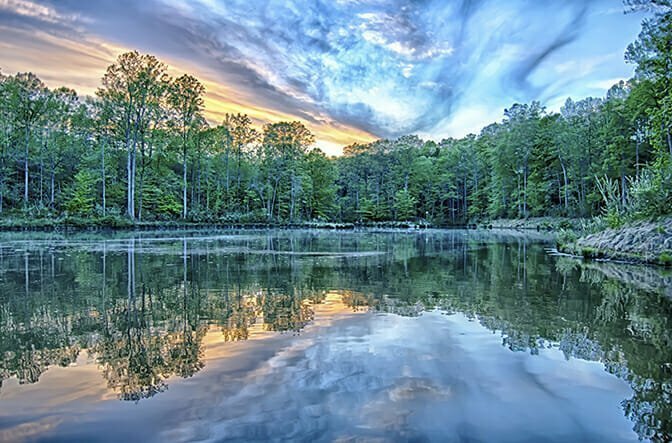 The temperate climate in the Midlands encourages outdoor-lifestyle recreations like golf and tennis, plus trail hiking in the Congaree National Park and the Sumter National Forest. But water sports are by far the local lifestyle recreation of choice: countless streams and rivers provide a variety of canoe and kayak trip opportunities and the area includes some of the South’s best freshwater lakes. On any given day and nearly every weekend, the Midlands lifestyle revolves around water skiing, jet skiing, sailing and power boat races. And the freshwater fishing is literally world-class, especially in Lakes Marion and Moultrie, from which a number of record catches have been landed. The equestrian-oriented lifestyle is also a Midlands feature. Camden hosts two major annual steeplechase horse races—the Carolina and Colonial Cups—as well as polo matches and other events. 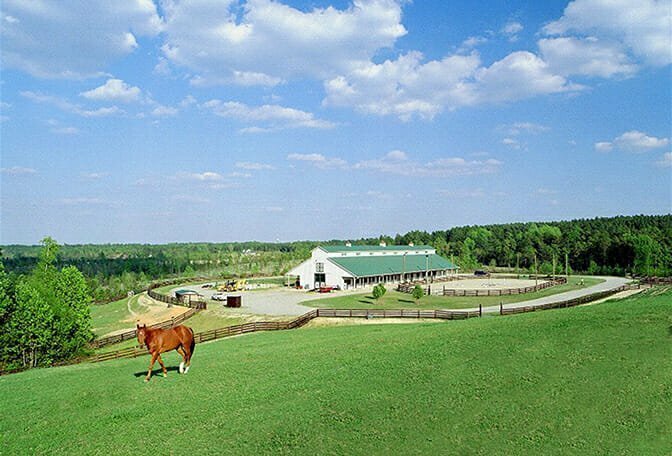 The Midlands’ other equestrian center is the Aiken area, which is home to a number of horse farms and hosts its own impressive calendar of events. 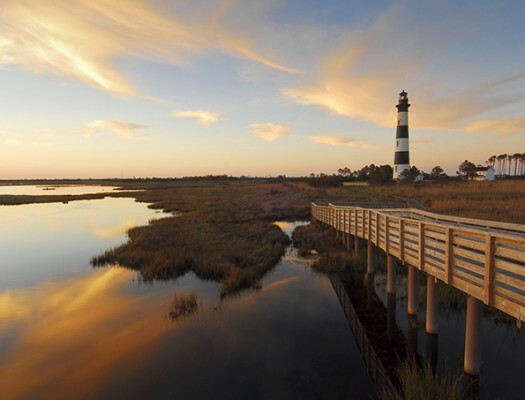 The North Carolina coast is probably best-known for the Outer Banks, a 200-mile-long series of barrier islands at the edge of the continent. 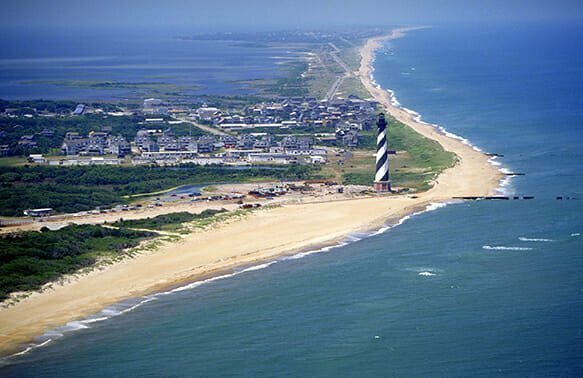 Accessible from the north by car and from the south by ferry, the Outer Banks beaches are among the nation’s most pristine and the off-shore fishing in the warm waters of the Gulf Stream are an exciting lifestyle attraction for many residents. Less well-known, but increasingly popular for retirees, is the “Inner Banks” region along the Albemarle and Pamlico Sounds, as well as rivers like the Roanoke and Chowan that flow into them. 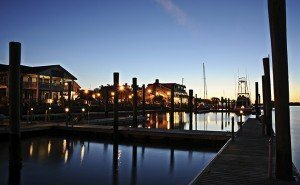 Along the Neuse River, still part of the Inner Banks, you’ll find Oriental, a waterfront community known as the “Sailing Capital of North Carolina.” The waterfront lifestyle in this region includes fishing, sailing, boating, kayaking, parasailing and every other water sport imaginable. Fresh-catch seafood is available year-round, and local farmers produce an abundance of vegetables for the dinner table. 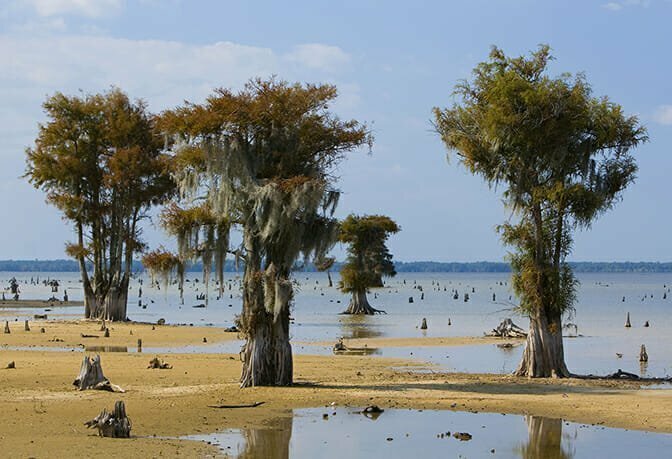 In the region’s wildlife refuges and nature preserves, there are numerous hiking and biking trails to enhance the outdoor lifestyle. But for those who like more sedate pursuits, the area’s many historic small towns have earned a reputation with antique enthusiasts and collectors as prime destinations. Several festivals devoted to local arts and crafts are annual events that highlight the coastal lifestyle. In addition, more than 20 community colleges in the area offer continuing education programs for retirees and other new residents who still have a love of learning. The Southern coastal region includes the thriving port city of Wilmington, a diverse community that hosts annual flower festivals and music events, as well as the largest film and television production studios in the Southeast. 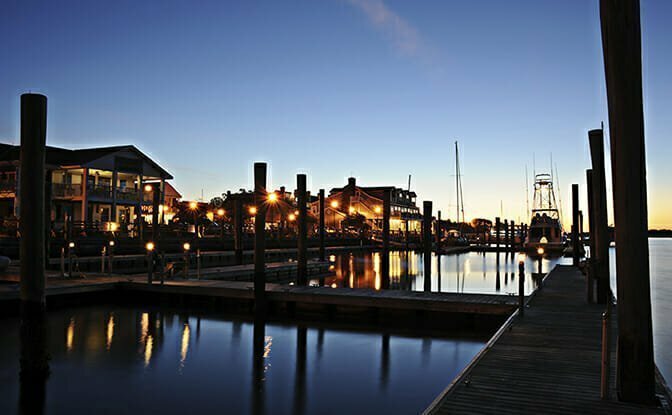 The revitalized riverfront district in downtown Wilmington offers a variety of specialty shops and casual restaurants, while the region’s sunny spring-to-fall weather encourages a local lifestyle with day trips to nearby Wrightsville Beach or Carolina Beach. 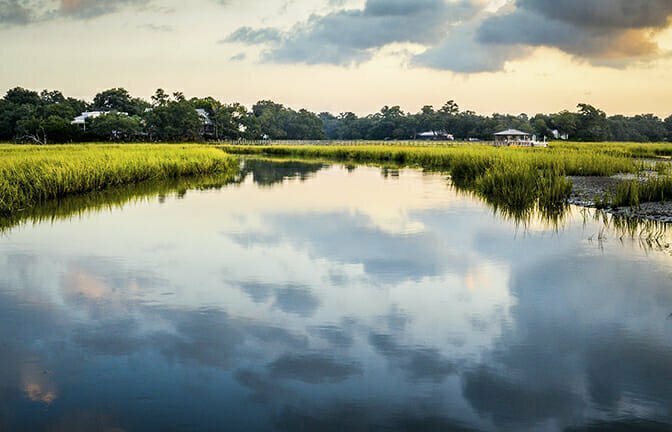 Brunswick County, the southernmost area on the North Carolina coast, is often considered to be part of the Carolina Grand Strand that stretches across the South Carolina border along 60 miles of coastline. 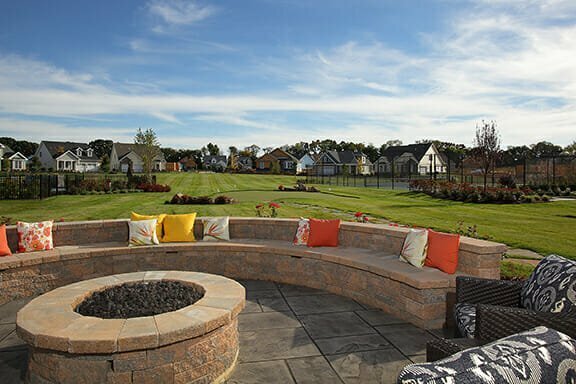 With more than 100 golf courses available for public play and a growing number of golf-centered residential communities, the links lifestyle is an attractive part of the area’s appeal. “I’m definitely a city girl gone country now,” says Bonnie Fell. Neil Fell’s mother was from the South Carolina Lowcountry, and he introduced his wife, Bonnie, to the region during summer vacations on Fripp Island. 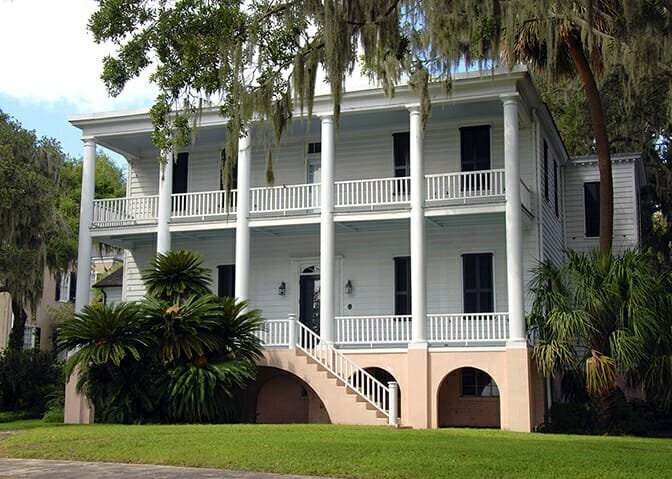 While raising their family in the Chicago area, Neil was a store owner and Bonnie worked in child advocacy programs until they decided to retire last year to Pinckney Retreat, a waterfront community on the site of an antebellum plantation located near the town of Beaufort. “There’s no other place in the whole world I’d rather be,” she says. 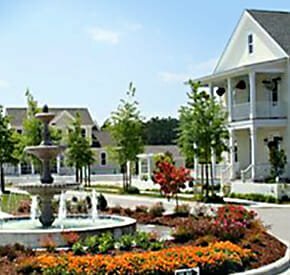 McLendon Hills is a premier lakefront community located just up the road from the Pinehurst area. Among its featured amenities is a full-service, state-of-the-art equestrian facility that includes more than eight miles of bridle trails. Peter and Marilyn Dotto moved to McLendon Hills from the San Diego area, where he had been a military contractor after his active-duty service as a Marine. She’s also a member of the community “Lunch Bunch” group and the garden club. Peter has served on a couple of local boards and is active with several military organizations that raise money and provide assistance for veterans. He also teaches a class at the Campbell University extension located at nearby Fort Bragg. 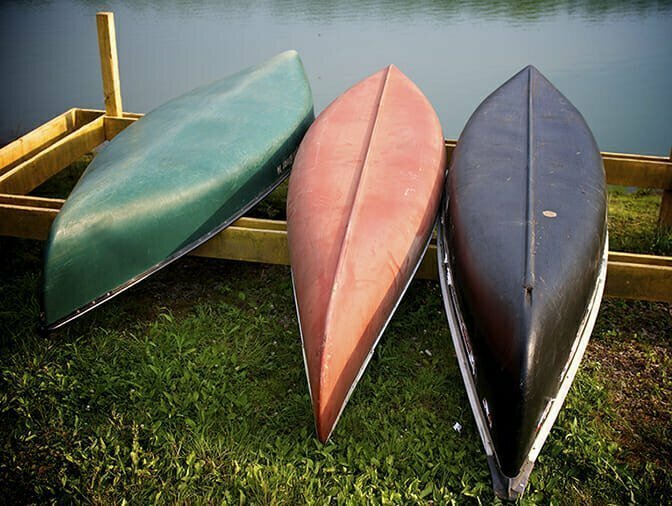 Both enjoy kayaking and boating on the McLendon Hills community lake, as well as a variety of social events. “Whoever said retirement had to be boring? !” Marilyn chuckles. Albemarle Plantation, a waterfront community located near the town of Hertford, NC, is owned and managed by its property owner’s association. 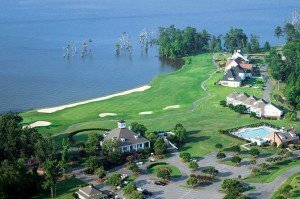 Amenities include a Dan Maples-designed golf course and full-service marina on the Albemarle Sound. By JG Walker Previously published in the 2015 Spring Issue. From Cooking Demos to Catering, Cooking Star, Fanny Slater, Shares Her Love of Creative Cooking. Wilmington, NC’s Fanny Slater made it to the big time when she won Rachael Ray’s Great American Cookbook competition last May with her “Tastes Like Childhood” theme. Out of 1,000 entries from around the nation, months later, Fanny’s demonstration video and recipes landed her in the top five. Then her “Tin Foil Surprise” of egg, orange-lavender fig jam, Havarti cheese and fresh green arugula took home the coveted grand prize (her sparkling personality did not hurt). Fanny’s cookbook will be available in 2016. 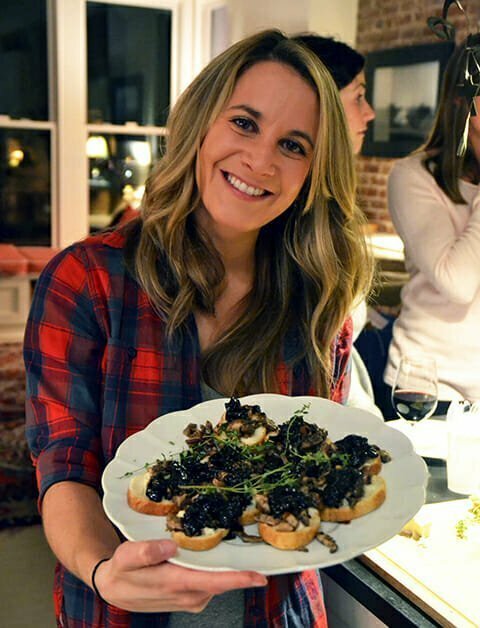 While Fanny now travels between Wilmington and New York, she writes a food blog, fanfarefoodie.wordpress.com, conducts cooking demos and classes, and caters events. She has also begun work on a television pilot. After her last trip to New York City, Fanny sat down with Ideal-LIVING to give a few cooking tips and share one of her recipes. Of your cooking classes, demonstrations or catering, what is your favorite? Well, it’s hard to say. I love them all. I just love to create. I enjoy the catering, as I can just spend my time cooking and dropping off the food, but then I don’t get the personal interaction. Cooking classes can be a lot of fun—it’s interactive and I can interweave my stories in with the food preparation. It’s great to get a group of people together who enjoy good food and entertainment. Often the groups will bring their own wine to pair with the food selections. But, I must say the cooking demos are my favorite–both the food and the stories get equal billing. To me it’s like bringing the Food Network into people’s homes. It’s interactive, entertaining and fun! It’s not just about the food—I love to share the stories of the food. I like for food to create a memory and that’s what I’m able to do with both the classes and the demos. What’s your favorite local ingredient? I like to shop at local farmer’s markets. It may seem silly, but North Carolina has a lot of great heirloom tomatoes. With spring in the air, my favorite ingredient is spring onions. They look like scallions, but with huge bulbs. I just cut off the bulbs, slice them in half, cut them into thin strips and roast them in the oven at 400° for about 25 to 30 minutes. The roasting caramelizes them, resulting in a very sweet taste to serve as a side dish. It’s so easy. What is the most underrated ingredient? It would have to be FRESH HERBS. I find that the average person does not cook with fresh herbs—people seem to think it’s easier to use dried herbs. My refrigerator is stocked with fresh herbs from sage to tarragon to ginger. You can use them in anything. Sprinkle some fresh oregano or parsley over your pasta—it can be that easy. One tip—basil hates the cold. If you purchase living basil in the store with the roots, just put the roots in a glass with a little water and let it sit at room temperature. It can last for weeks that way. Do you have any tips for cooking for two people? One of my staples at home is pan-seared chicken thighs. One package of six serves two to three people. You can sear the chicken in an oven-ready pan, then using the same pan, add some potatoes, shallots and wine, then roast in the oven. You can’t overcook the chicken. The best part is you only have a cutting board and one pan to clean. Position an oven rack about 6 inches from the heat and pre-heat to low broil. In a medium skillet, sauté the bacon over medium heat until crisp, 8 to 10 minutes. Remove the bacon with a slotted spoon and set aside on a paper towel. Pour out some of the bacon fat (so you’re left with about 2 tablespoons), and add the spring onions to the pan. Season with salt and pepper and then sauté, stirring occasionally, until the onions are lightly caramelized, 4 to 6 minutes. In a medium non-stick broiler-proof skillet, heat the butter over medium heat. In a bowl, whisk the eggs with the half-and-half, dill, 3/4 teaspoon salt, and 1/2 teaspoon pepper. When the butter begins to foam and sizzle, pour the egg mixture into the pan. 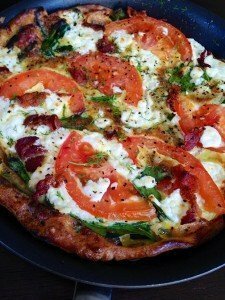 Evenly drop in the cooked bacon, spring onions, spinach and goat cheese. Using a heatproof spatula, pull up the sides of the egg mixture and tilt the pan so the liquidy uncooked egg on the top goes to the bottom of the pan. Continue doing this until the frittata is mostly cooked through, but still slightly liquidy on top, 1 to 2 minutes. The bottom should be lightly golden brown. Arrange the tomato slices on top and sprinkle with the red pepper flakes and an additional pinch of salt and pepper. Place the entire pan under the broiler. Cook for 3 to 5 minutes, keeping the oven door slightly open and rotating the pan to get even heat if necessary. Keep a close eye, as the frittata can burn easily under the broiler. The frittata is done when it’s very fluffy and golden brown on top and no longer runny in the middle. Cut into pie-like pieces and serve. Previously published in the 2015 Spring Issue.